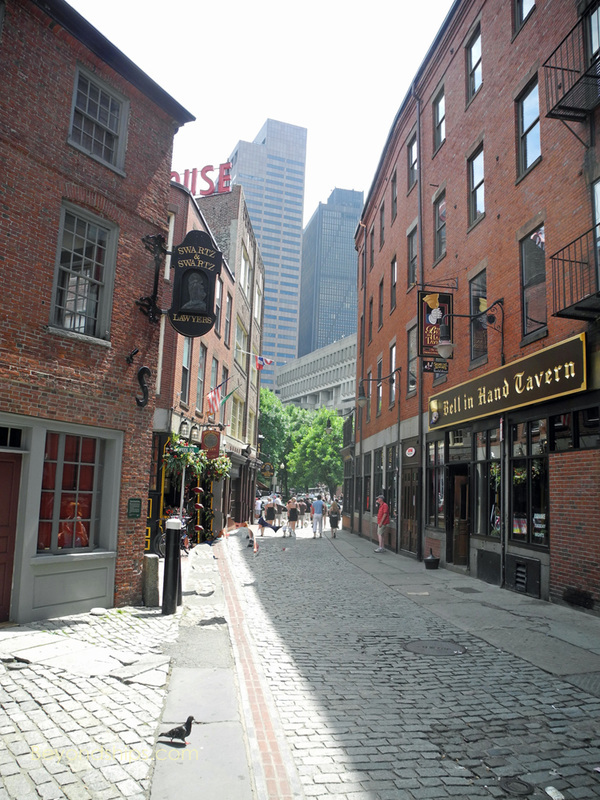 The Freedom Trail is a walking route that runs through the heart of Boston linking many of its historical sites. It encompasses sites from Colonial era, the Revolutionary War, the War of 1812, the Civil War and into the modern period. About two and a half miles in length, the Freedom Trail runs from the heart of Boston and across the Charles River. Inasmuch as the historical sites do not lie in a straight line line, you have to zig zag somewhat. In this feature, we shall look at some of the sites between the Boston Common and the Charles River. The starting point of the Freedom Trail in the Boston Common, the oldest public park in the United States. Dating from 1634, it was first used as common land where Boston residents could graze their cattle and sheep. Those who broke the law could find themselves here for public punishment or even execution. With its large open space, the Common was also used for drilling the militia. British troops were encamped here during the occupation of Boston during the American Revolution. Today, the Common is a vast green space in the heart of urban Boston. In addition to trees, grass fields and ball fields, its attractions include a merry-go-round and a frog pond. Neighboring the Common is Boston Public Garden, America's first botanical garden. More structured than the Common, this 22-acre Victorian garden has formal plantings and displays of ornamental flowers. 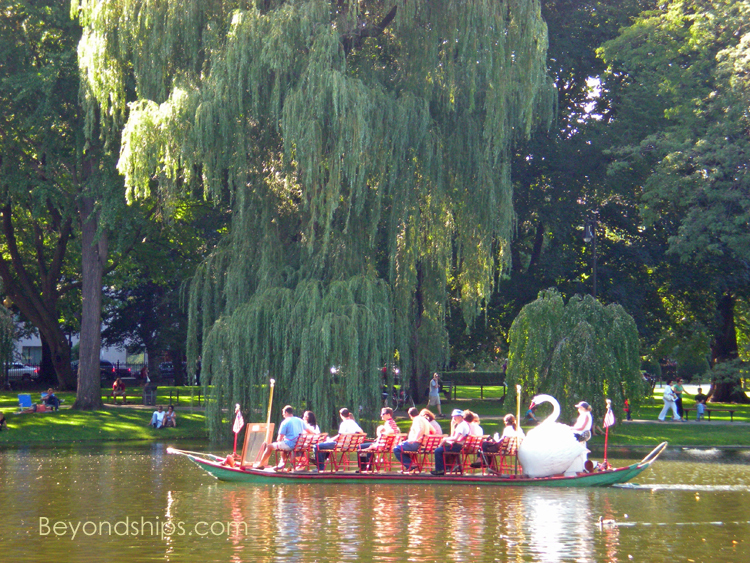 A popular feature are the Swan boats that ply the lake in the center of the Garden. covered in 24 karat gold. Down Park Street on the same side of the street as the Commons is the Robert Gould Shaw/54th Massachusetts Regiment Memorial. Shaw was from a Boston abolitionist family and took command of the untried all-volunteer black regiment at a time when there was considerable debate over whether blacks should be allowed to fight in the military. The regiment earned distinction in several campaigns during the Civil War. 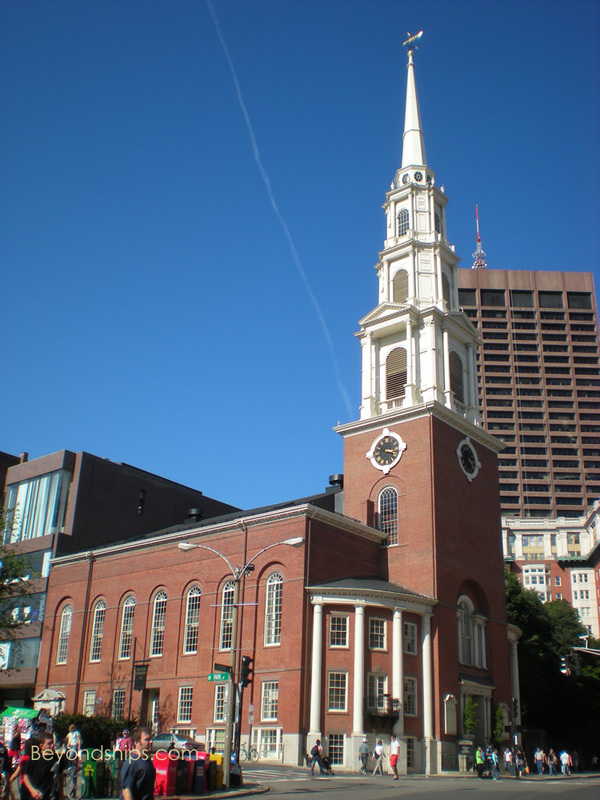 Also adjoining Boston Commons at the corner of Park Street and Tremont Street is the Park Street Church, built in 1809. Its 217-foot spire once dominated the Boston skyline. Among the firsts that occurred here were abolitionist William Lloyd Garrison's first anti-slavery speech and the first performance of the American patriotic hymn "My Country 'Tis of Thee," which was sung by the children's choir to the tune of "God Save the Queen." The church stands on ground that once was the city's granary and just down the street is the Granary Burying Grounds. It is the final resting place of three signers of the Declaration of Independence including John Hancock, the President of the Continental Congress and first elected-governor of Massachusetts. Also buried here are Samuel Adams, one of the most prominent leaders of the Independence movement, Paul Revere, Revolutionary War hero, and Mary Goose, author of the Mother Goose stories.